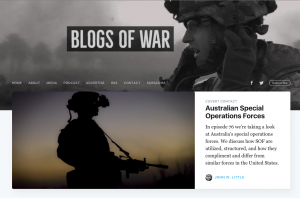 Covert Contact is hosted by Blogs of War creator John Little. His work and analysis has been featured on the BBC, CBC, ABC, PBS Newshour, Fast Company, CBS, CNN and other international media outlets. The Blogs of War Twitter feed, @Blogsofwar, was selected as one of the top Twitter accounts of 2014 by Time magazine. This week Lynnette Bukowski joins me to discuss LZ Grace Warriors Retreat. Lynnette, and many volunteers, have transformed a 38 acre farm in Virginia Beach into a place for members of the special operations community and first responders to decompress and recharge. Lynnette shares the story of her husband, a Navy SEAL, and we discuss some of the unique challenges the she faces in supporting who are accustomed to serving, and often suffering, in silence. The episode closes out with another update on Russia, and their involvement with Hezbollah, from William Tucker. New to Podcasts or Covert Contact?